Item Number: 184-2-03W 17434 Actual Weight: 18 lbs. Protects clothing from dust, dirt, and moisture. 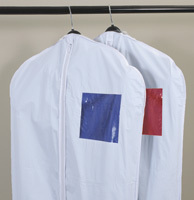 Opaque white vinyl bag has full zipper in front and 3-inch opening at top for hanger. 6 by 6-inch clear plastic window on front of bag allows for easy identification of contents.